After a number of months in development, Fighting Fantasy Classics is finally available to download from the App Store! 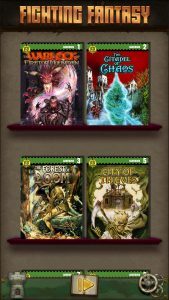 Fighting Fantasy Classics is a brand new library app for iOS that will also be released on Android and PC/Mac very soon. The app will ultimately collect together many of your favourite Fighting Fantasy gamebooks from the 1980s until now! 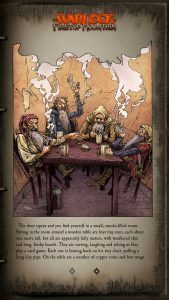 The app is free to download and we’ve included Jonathan Green’s Bloodbones for FREE, with The Warlock of Firetop Mountain, The Citadel of Chaos, City of Thieves, The Forest of Doom, Caverns of the Snow Witch and Island of the Lizard King available to buy for just $1.99USD for a limited time! One of our most frequently asked questions is in relation to our existing FF apps as some fans are concerned that they will need to buy these apps again. We can assure owners of our older apps that these digital gamebooks will continue to be supported by Tin Man Games, so there is no need to re-purchase. Sadly we can’t migrate these purchases across to the new library app though. So what’s next (our second most frequently asked question)? Well, we’re so excited to say that we have lots of classic Fighting Fantasy adventures coming down the pipe including Deathtrap Dungeon, Freeway Fighter, Sword of the Samurai, Trial of Champions, Temple of Terror and many more. We’ll also be re-releasing House of Hell, Starship Traveller, Appointment with F.E.A.R. and Blood of the Zombies too in this new/old format! We’ve had a few bugs and issues with this release, which is one of the reasons why the Android version is a bit late, so please bear with us while we make some changes – including the addition of a new mapping feature for ALL gamebooks. And if this news wasn’t exciting enough for the team, we have some more HOT TIN MAN GAMES NEWS coming next week during the Game Developer’s Conference in San Francisco! We’ve been hinting for a while now about a new VR title we’ve been working on for the past 18 months. Well, it’s almost time to reveal all and we might just explode.